Buyers can often get their dream homes when purchasing new construction homes. Newport News is the perfect place to find this type of real estate as there as many developers in the business of making dreams come true. Buying a brand new house that no one has ever lived in can bring unparalleled satisfaction. This area of Hampton Roads gives buyers the choice between single-family houses, townhomes and condos. Homebuyers even have the option of purchasing property and building their own homes for full customization. There are so many lovely, established neighborhoods in Newport News, why should anyone consider buying a new home? If everything is new than it will be longer before it needs repairing and replacing, so maintenance will not be a concern. Many of today's homes come with ample storage space, open floor plans and larger rooms; designs traditionally not seen in older homes. Builders now use appliances, doors, insulation and windows that promote a greener environment and energy-efficient households. Choosing a property during the construction phase or planning a home from scratch allows buyers to customize their home specifically how they want. Most builders today provide clients with warranties, which is always nice to have just in case. Buying a new home means no one has ever lived in it before. There's no changing out stained carpet or painting over red walls because now the buyer calls the shots all the way. Newport News is a prime location to consider purchasing a new construction home. This city is nestled in the peninsula of Hampton Roads and offers something for everyone. Homes here are close to metro area amenities without compromising peace and quiet. Explore Lee Hall Mansion, the Virginia Living Museum and the Virginia War Museum to learn more about the culture and history of the state of Virginia. Take in a concert or show at the Ella Fitzgerald Theater or the Ferguson Center for the Arts. Catch the big one at the James River Bridge Fishing Pier. Enjoy the largest municipal park on the East Coast at Newport News Park. 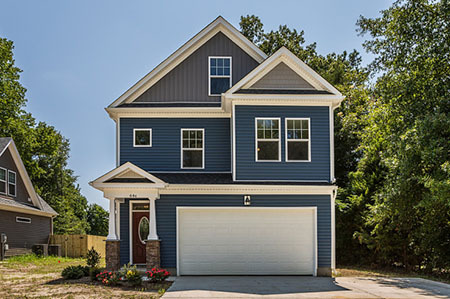 New home communities abound in Newport News. Homebuyers will have to decide what types of homes they want, if amenities are important, acceptable locations and price point. New single-family homes may be available in neighborhoods like Stoneybrook Estates, Turtle Creek, Heather Heights, Oak Ridge and Libby's Garden. Buyers with active lifestyles may like attached housing options such as condominiums or townhouses. Homebuyers may find new construction condos at The Point at City Center, Windy Knolls, Meridian Parkside, Colonial Crossing, Jefferson Estates and Courthouse Commons quite appealing.